Supreme Leader Snoke in his new gold robes just like the Lego mini-fig. Those guards seem cool, but the Knights of Ren still need to be in this film. I raced here to try and supply a link to them myself. lol One has to be QUICK around here! I love what I see here. Snoke's bodyguards look AMAZING. I can't wait to see them in action. The few rumors I'd been reading about Snoke's non-holo appearance left me skeptical - but here it looks great. Rey IS in possession of Anakin's saber. That gap near the emitter that emits a glow (something we haven't seen from it prior to Disney's takeover) must be canonical. Bummer. That little blue glowing gap looks weird as can be to me. Ren's wounds seem to have healed remarkably well. He must've been diligent with his thrice-daily applications of Bacta Cream. And Luke? Still no lightsaber to be seen. I wonder if his wooden cane has one hidden inside of it, or is he a Force-God that no longer needs a lightsaber being that he's The Zenith of Force-training? And I agree in regards to the Knights of Ren - we need to see some clear shots of them for once. One more thing about Luke - now that it's canonical that a Dark Side Force user must corrupt/bleed a "good" crystal - it'd be epic if Luke gets his hands on Ren's raging saber, tames its flaring behavior, and changes the color from red to blue or green. Man, I love the thought of that. ... One more thing about Luke - now that it's canonical that a Dark Side Force user must corrupt/bleed a "good" crystal - it'd be epic if Luke gets his hands on Ren's raging saber, tames its flaring behavior, and changes the color from red to blue or green. Man, I love the thought of that. Luke's outfit doesn't seem conducive to battle. It's too restrictive. Maybe that's a tell for the "Force-God" theory. But, why is in hiding if he's all-powerful? I'm not sure why he even has a cane. Does he have limp? Or, is it a Palpatine inspired fake-out? Ben's saber was originally green. But, the color change wasn't instant. If Luke needs to use a lightsaber, it should be his ROTJ lightsaber. I don't think we'll see his Jedi saber, though. They remind me a little of the guards in ROTJ. The original guards' design wasn't great - a red long plastic blob for a helmet, shapeless robes and with a slit for eyes. There are quite a few stink bombs when it comes to creature and equipment designs throughout the film series. I like the juxtaposition of smooth surfaces atop of interesting and overlapping shapes. Their armor style reminds me a bit of Frank Miller's work in his seminal "Ronin" graphic novel. Luke has a large, interior pocket on his left side. Notice that it's empty, however. There MIGHT be a split 2" down from the leather wrapping on Luke's cane- perhaps the dragon portion is the hilt of a lightsaber? 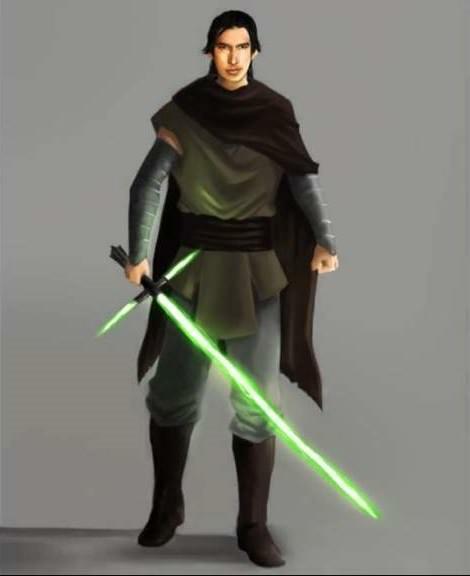 I didn't realize that it was canonical that Ben Solo's original saber was green and of the broadsword style of Kylo Ren. Mike Zeroh is claiming that there were two other Snoke pictures in the leak. One was Snoke on his throne in the red throne room (the one we saw in the BTS D23 reel) with the guards to his side. Is he full of crap or has anyone actually seen those? Mike jumps to conclusions in ridiculous ways. There aren't any more than one Snoke TLJ pics. There are concepts from EP7 and fan art, but that's it online. Mike Zeroh - I don't know how he gets and maintains any attention. The man is wrong 99.999% of the time. A lot of his conjectural statements are sheer lunacy. 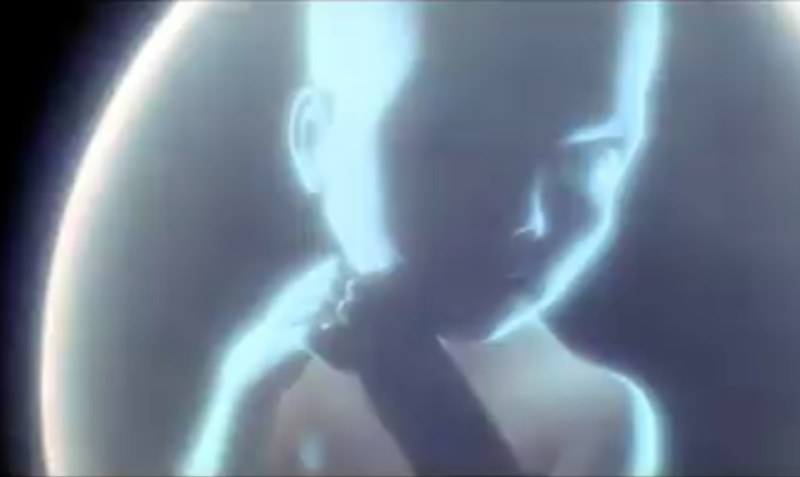 There's been a leak of toy images from Ep 8, and two of the more interesting ones are of the white-cloaked Luke and gray Rey. In the box, it's readily apparent that she comes with weapons and other gear. Luke has nothing visible. Then they're unboxed. Yup, Rey has a ton of stuff. Luke has nothing other than the clothes on his back. I'm nervous with the idea of him being a Force God. Initially, I liked Yoda's "magical fight" against Dooku, but upon repeated viewings it doesn't hold up well. Neither do any of the absurd Mario World saber duels. The films work best when they hew close to humanity and its vulnerabilities. At least to me it does. 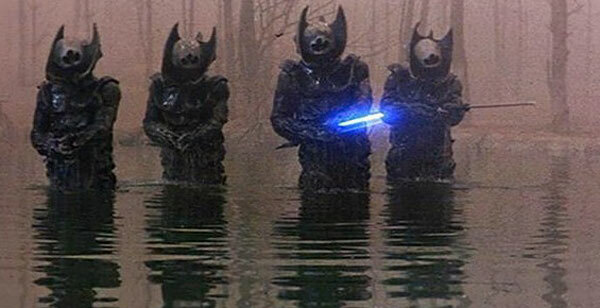 Krull wasn't a terrible movie. the other thing it reminds me of is this.